Recording a refund in CompuDance. If you are issuing a Credit Card or ACH transaction, this will not refund the money to the family. You must issue a refund for the money through your credit card/ACH processor. First, you need to add a new Income Category and name is “Refund”. You do not have to set a price for this income category. You can only have one income category called REFUND, do not change the name of this category. 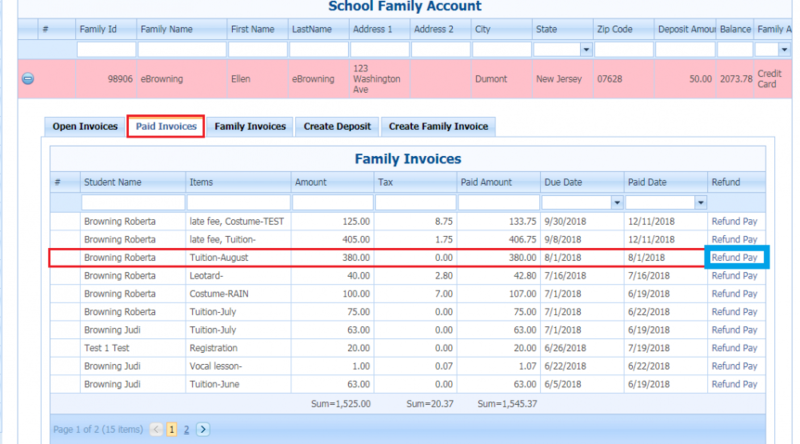 Click on Admin > School Setting Types > Income Categories > Add New Categories. Once the Refund category is created, you can issue the refund. Click on their Paid Invoices tab. Find the invoice you are refunding and to the right click on Refund Pay. This will bring you to a page where you may add a note if needed. After you add your note you can click Pay Refund. This will subtract that money from your Sales report under the method of payment originally used to make the original payment. Once the refund is paid, it will change the Status of that invoice to Returned. You can go into View/Pay Invoices and search on the Status Returned. This will show you all refunds.